Left brain, right brain, pug brain. 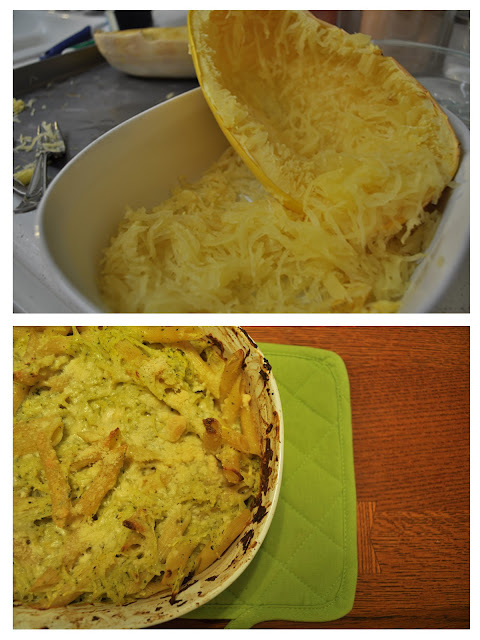 : Twice-baked Pesto-Alfredo Spaghetti Squash. Cut spaghetti squash in half and scoop out seeds. Place in a pan and pour 1/2 cup water around bottom of squash. Roast for 45 minutes. In the meantime, bring water to a rapid boil on the stovetop. Add penne and boil for 15-20 minutes, stirring occasionally. Add salt to taste. When squash is ready, remove from oven and let cool for a few minutes (should be firm, but easy to scoop out). Scoop squash out in strands and place in a baking dish. Add pesto, penne, alfredo sauce and 1/4 cup parmesan and mix well. Sprinkle remaining parmesan on top. Bake for an additional 20-30 minutes, until cheese is melted. Serves 8 (1 cup) at 184 calories per serving.